Now that it’s cooler outside, I’ve been passing over the post-workout smoothies I had all summer long for a warm protein cake. And since it’s pumpkin season, I had to experiment with a pumpkin version! And since who doesn’t need a little chocolate after a hard workout, I added in some mini chocolate chips which melt perfectly. Mix together all ingredients and microwave 60-90 seconds until outside is firm but inside is slightly gooey. Now that it’s getting hot outside, there’s nothing better than cooling down with a cold smoothie. 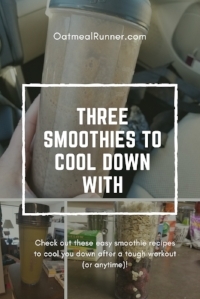 Whether it’s post-workout or as a meal, here’s three easy smoothies that blend up quickly! Best enjoyed after a super sweaty workout when you are drained and need an extra caffeine boost. A taste of the tropics no matter where you are plus adding in spinach gives you a serving of vegetables without you realizing (beyond the mint green smoothie color). I love this smoothie after an early morning run since I don’t eat before these runs! It’s an easy way to cool down and have my usual berry oatmeal. Throughout marathon training, I felt tightness in my glutes and hips. I’ve already shared my favorite hip opening stretches so today I’m sharing four of my favorite glutes stretches. As an extra bonus, all also help with hip tightness! Start sitting with your legs extended straight in front of you. Bend your right knee and place your right heel as close to your left sit-bone as feels comfortable. Reach your right arm behind you, planting your fingertips or palm on the floor. Place your left hand on your right knee and gently pull your knee to the left until you feel the stretch in your glutes. Holds for 30 seconds, then release and repeat on left side. Bring your right leg forward and sink down so the outer edge is resting on the floor. Sit on your mat cross-legged. Lift your right leg and cradle it your right arm. Hold your foot with your hands for support as needed. Slowly lift up your right leg until you feel a stretch in your glutes and hips. Hold for 30 seconds and repeat on left side. If needed, gently rock your leg from side to side to move the stretch to different parts of your glute and hips. Begin lying flat on your back, both knees bent. Cross one leg over the other so that your ankle is resting on the opposite knee. Gently pull the uncrossed leg toward your chest until you feel a deep stretch in your glute. Hold for 20 to 30 seconds, then switch legs. 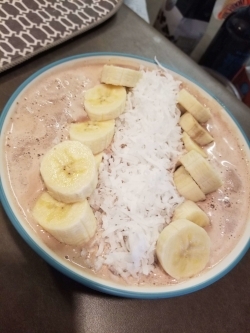 Today I wanted to share a quick recipe for the smoothie bowl I whipped up after my 10 mile treadmill run yesterday. 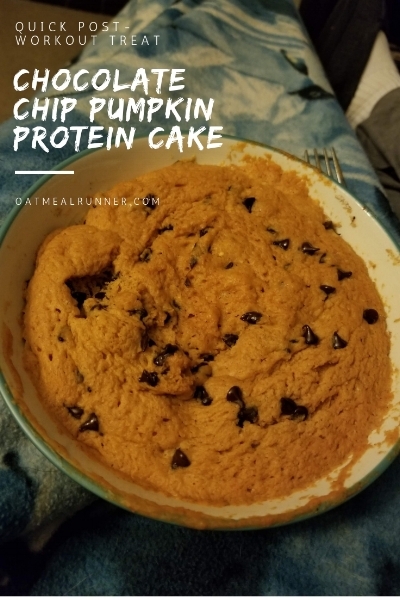 It was super easy and delicious, plus nice and cold after my sweaty run! One thing I still need to figure out is how to get it thicker but it was delicious anyways. Blend ice cubes, greek yogurt, protein powder and cocoa powder in blender until smooth. Pour into bowl and top with sliced banana and coconut. I made it pretty for a picture and then mixed everything together to eat!